And all of a sudden, this blog is five years old! I’d like to take a moment, before the day runs out, to mark the occasion. Frankensteinia launched on August 20, 2007. Over these last 5 years, we’ve made 750 posts and recorded more than 930,000 hits. By year’s end, we’ll go over one million visitors. Combining average daily hits with our subscribers on Google Reader, Facebook and Twitter, we boast some 4,000 regular followers. These numbers boggle my brains. In 5 years, we’ve garnered 7 Rondo Award nominations in 3 different categories, good for several Honorable Mentions, a couple of Runner-Ups and, of course, a beautiful Rondo for Best Blog, in 2010. In the schorlarly world, Frankensteinia has been recognized as a resource by Intute, a consortium of seven British universities; the Museum of London, and consulted by the New York Public Library. Looking back, I’m proudest of our “discoveries”, little facts — and big ones — and new information we’ve uncovered. This year alone, we revealed never-before-seen photos of Primo Carnera’s Monster from a 1957 television play (here and here). I’m proud of our Silent Frankenstein series where we found tons of new information about Life Without Soul (1915), and a photograph of Il Mostro, from the Italian Frankenstein of 1920. Most fun was finding an explanation for the curious, branch-like hands of Edison’s Frankenstein of 1910. It seems The Monster's hands came… from Mars! Go Look! Now, autumn looms and posting here will pick up, as it must, during our busiest season. I’ve got a lot of new and fun material, ready to go. I have piles of Frankenstein books, many new ones, to review, and new discoveries to share. Over the next few weeks, I’ll be revealing a lost Frankenstein film appearance from the Thirties (! ), and startling new information about Mary Shelley’s very inspiration (!!!). As we begin our 6th year, I want to thank you, all who visit, and especially you regulars. You know who you are. You keep me going. 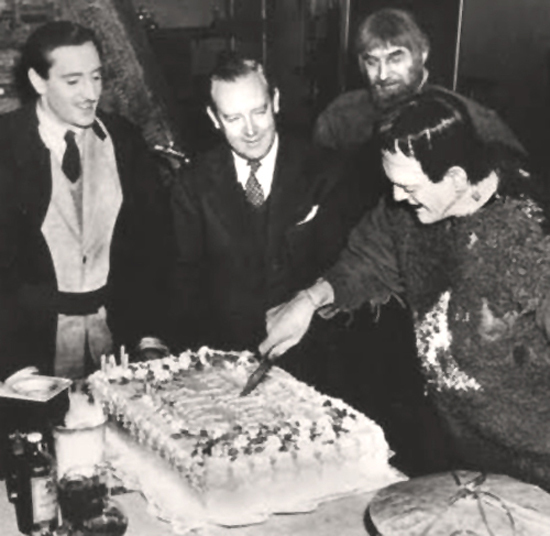 Photo at top shows Boris Karloff celebrating a 1938 birthday on the set of Son of Frankenstein (1939). Later, the same day, Boris would celebrate again when news came that a daughter, Sara, was born. Wow! Congratulations on five incredible years! This blog is one of the most brilliant creations the internet has yet experienced. Here's to five more years! I've been reading your Blog since day one "IT'S ALIVE!" There's no better archive of Frankenstein related treasure. Many happy returns and Very 'Beast Witches' on your 5th birthday. Here's to a new world of Frankensteinia and cake! One of my favourite blogs. Thinking of doing some scans of illustrations from an abridged Frankenstein that meant a lot to me as a kid. Will send them your way! Congratulations, Pierre! After 5 frantic years, the hits just keep on coming. Thanks for all the wonderful scholarship, and many happy returns! Happy Birthday, Frankensteinia! And congratulations, Pierre! For 5years this has been a happy stop every day when I turn the computer on. Here's to many more. Couldn't happen to a greater site, or to a nice guy! This site has been a model for other blogs for five years, and is consistently superb. Congratulations on reaching this milestone, Pierre! I'll take this opportunity to thank you for all this great material... and you've given some very tantalizing hints of what's ahead! Congrats, Pierre. You do an incredible job here. This is unquestionably one the best blogs I've ever seen. Congratulations. I've been reading your blog for quite awhile. It's always nice to know I'm not alone in my obsession. Fantastic job! "Here's to a new world of gods and monsters,"